Barcelona is a gorgeously unique city backed by forested mountains and fronted by the Mediterranean Sea. It is the capital of Catalonia, a region within Spain but one which, with its own language, history and customs, often regards itself as a separate country. 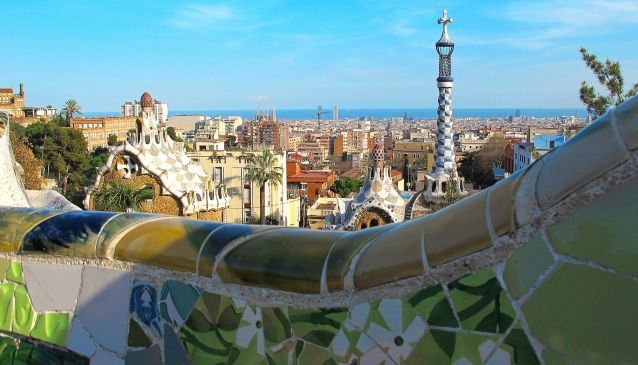 Like all of the world’s great cities Barcelona could keep you busy for months but its highlights, from the extraordinary Sagrada Familia to the dazzlingly surreal Park Güell, are possible to see in a weekend. The latter two examples are both creations of Antoni Gaudi (1852-1926), a master architect who is responsible for much of the city’s fantastical architecture and is as synonymous with Barcelona as Christopher Wren is with London. Spring and particularly early or late summer are the best times to visit Barcelona; try to avoid July and August as the city becomes stifling and is plagued by tourist crowds. In the warmer months you can make full use of the vast stretches of sandy beaches which flank the city’s eastern edge, and the parks and gardens – an essential Barcelona experience – are in full bloom. Furthermore, due to the architecture playing such an important part in the city’s character, much of your sightseeing will be done outdoors. Barcelona has all the major transport hubs you would expect, including rail, sea and road, but if you are visiting for a short break, unless it forms part of a larger trip, the most convenient way to reach the city is by plane. The international Barcelona airport is serviced by flights from all major European destinations and also places further afield, but if you’re travelling significant distance you may have to catch a connecting flight. The airport is just 12km from the city centre, which can be reached by either shuttle bus (departs every five minutes), train (departs every 30 minutes) or taxi. Barcelona is a large city which covers over 100km2 but the main clutch of sights are within fairly close proximity. 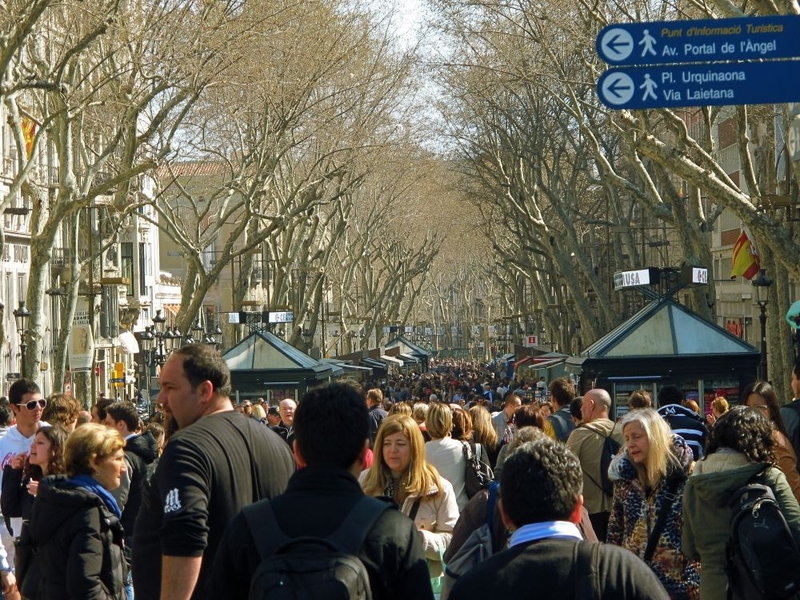 A good point of reference is Les Rambles, an iconic, pedestrianised boulevard which surges for over a kilometre through the heart of the city, all the way from Plaça de Catalunya to the harbour. Surrounding Les Rambles on both sides is the district of Ciutat Vella (“old town”), which comprises some of Barcelona’s most picturesque areas, including the revamped waterfront and Barri Gòtic, which is home to some of most beautiful Gothic architecture in Europe. Immediately north of Ciutat Vella is the district of Eixample, famous for its deluge of modernist buildings, many of which are the creations of Antoni Gaudí. To the north of Eixample more evidence of Gaudi’s legacy can be found in the Gràcia district, notably in the form of Parc Güell. 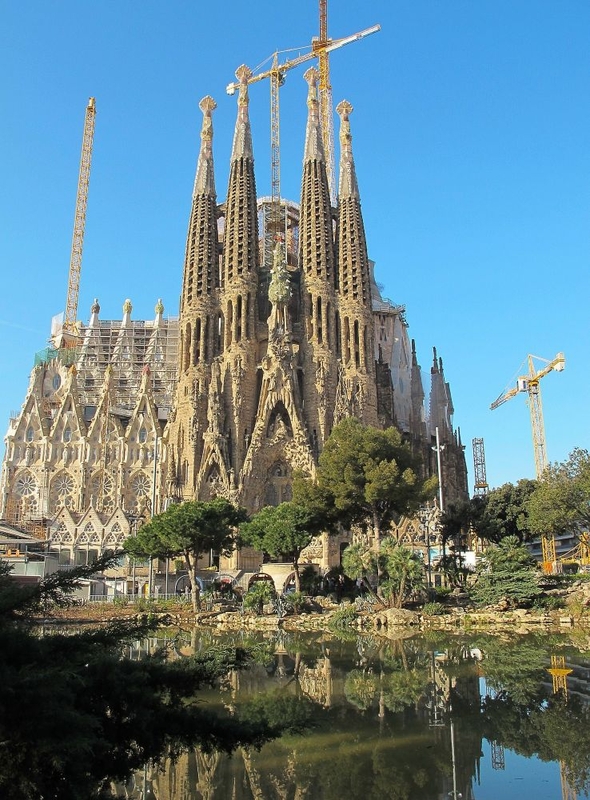 It may be heaving with tourists, you may have already seen it a million times in photographs and it may be expensive to enter, but you simply cannot miss the Sagrada Familia. Despite still not even being finished, this majestic basilica is Barcelona’s top attraction and Antoni Gaudi’s masterpiece. Construction began in the 1800s and the project is forecast to be completed in 2026. For another dose of the surreal head to Parc Güell, a UNESCO-listed green space webbed with winding paths, psychedelic sculptures and mosaicked terraces. Barcelona is full of world-class museums, but if you have to choose just one check out the Museu Picasso. Set within five mansions in the heart of the Old Quarter, this gallery displays some of the great artist’s finest work. 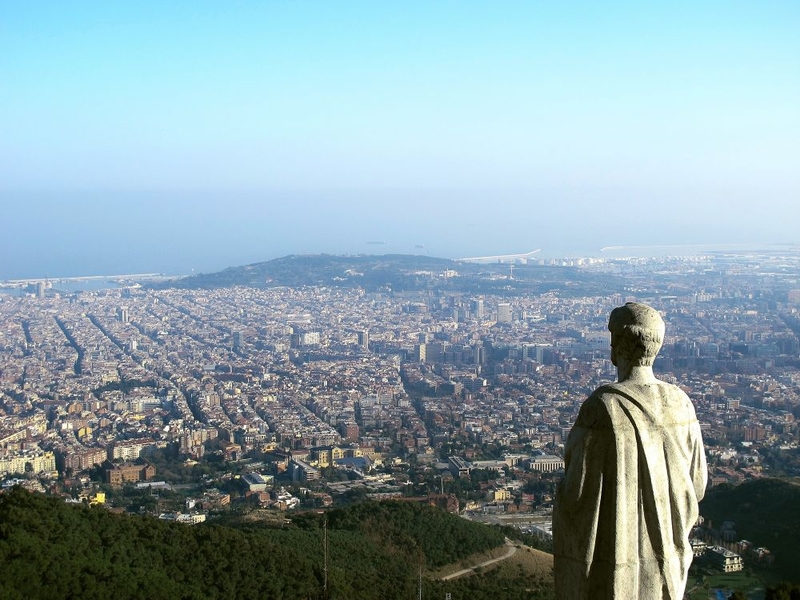 There are so many amazing experiences to be had in Barcelona, such as walking the length of Les Rambles, taking a Segway tour or visiting the retro theme park at the top of Mount Tibidabo, but the ultimate has to be watching Barcelona’s football team – arguably the best in the world at the time of writing – play a game at their home ground, the Nou Camp stadium. This epic structure is the sporting equivalent of the Sagrada Família and can hold a whopping 98,787 fans – twice as much as Rome’s Colosseum in its heyday. Barcelona is a shopper’s paradise. You’ll find a bewildering array of souvenirs along Les Rambles and throughout the surrounding area, though be careful as many of these are not authentic Spanish or Catalan products and are often overpriced. Barri Gòtic has some of the finest shops in the city and some of which are worth a look just for their beautiful interiors, such as candle-selling Cereria Subirà, which still has its original baroque décor and is the oldest shop in Barcelona. If you can afford to splurge then head over the Passeig de Gràcia within the Eixample district, a street defined by its stunning post-modernist architecture and seriously expensive outlets. Barcelona boasts some of the best restaurants in Europe and the cuisine is one of the main draws to the city. A particularly good choice is Flash Flash, which is located in the Sarrià-Sant Gervasi district and is as much loved for its original 1960s décor as it is for its delicious fare. The restaurant specialises in traditional Spanish tortillas (there are a whopping 70 varieties on the menu) as well as succulent homemade burgers. Barcelona is one of the coolest cities in the world so it naturally follows that its nightlife is second to none. You’ll find brilliant bars and clubs everywhere in the city centre, but especially good is L’Entresol, located in the Gracia district. It features uber-cool interior design – fresh, clean and contemporary – and a staggering array of gin and tonics. It’s not unusual to see famous faces in this place and it is open until the small hours. Barcelona is well serviced by public transport, which includes an extensive Metro network, so the most important thing if not staying in the city centre is to be close to an underground stop. Ideally, however, you’ll stay in the city centre, which will put you within walking distance of all the major attractions. Budget: Barcelona has some great hostels in great locations. One of the best is Kabul (€26 per night), which is situated in the heart of Barri Gòtic. It’s a bit of a party hostel, so avoid if you are looking for peace and quiet. Midrange: Nouvel (€99 per night) is a lovely hotel located towards the top of Les Rambles. It is housed in a fantastic modernist building and each room has been individually designed. Top end: Nestled between Les Rambles and the Plaça Reial, Hotel DO Plaça Reial (€195 per night) is a splendid place. The building dates back 300 years, the rooms are luxurious and there are two onsite awarding-winning restaurants.